Say the name Beetlejuice three times and there's no end to the mischief you'll endure. This Rock Candy Lydia Deetz figure can tell you all about it. After all, it's not every modern teenager who finds herself wearing a red wedding dress for her nuptials to a nuisance ghost. 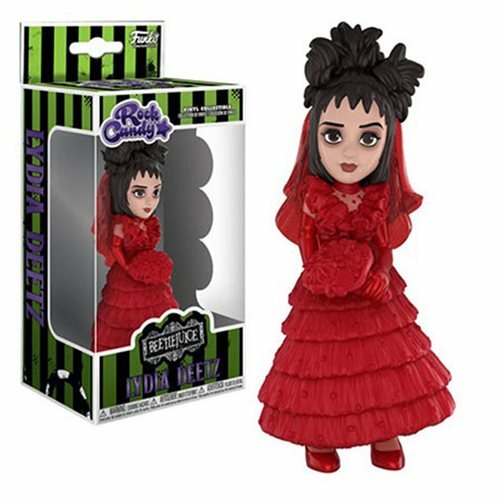 Celebrate Halloween, rogue spirits and Beetlejuice with this Beetlejuice Lydia Deetz Red Wedding Dress Rock Candy Vinyl Figure. Measuring approximately 5-inches tall, it comes packaged in a window display box.